The nation’s most devastating storm since Katrina, Hurricane Sandy brought destructive winds, storm surge, and heavy precipitation to much of the nation’s Mid-Atlantic region, leaving New Jersey and New York City particularly hard hit. With strong winds felt from North Carolina to New Hampshire, WeatherFlow Inc.’s network of weather observing stations was uniquely positioned to capture the storm’s effects over the entire region and provided critical information to government and industry users. Over the course of the storm, WeatherFlow’s network had more than 130 stations record wind gusts of 50 mph or greater, some for periods of up to 18 hours. The maximum winds registered by the network include a 96 mph gust recorded on the top of the Eaton’s Neck, NY Lighthouse, and an 88 mph gust at a WeatherFlow Hurricane Network station atop a dedicated pole near Tuckerton, NJ. This wealth of data makes Hurricane Sandy one of the most well documented tropical systems in history. WeatherFlow operates a mesoscale observing network to support a variety of clients that require additional weather data beyond the baseline information available from the federal government’s official observing network. Working with its clients to identify and address their particular needs, WeatherFlow stations are sited to optimize the collection of high quality weather data in critically important locations. 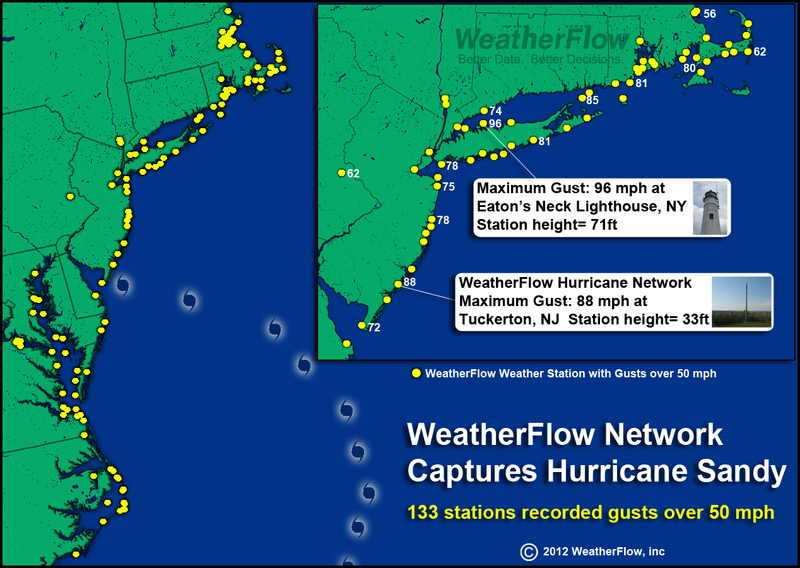 Of particular value during Sandy were the WeatherFlow Hurricane Network stations. These stations are specifically designed to survive and continue recording high quality, high resolution data during the severe conditions experienced during hurricane land-fall. Installed in 2007 in a cooperative effort between WeatherFlow, industry, and government partners, the Hurricane Network consists of 100 hardened stations located along the U.S. coastline from Texas through Massachusetts. 31 Hurricane Network stations reported 50 mph or greater wind gusts during Sandy, with data successfully collected from all 31 throughout the storm. WeatherFlow Inc. owns and operates a proprietary mesoscale network of weather observing stations, with a strong presence in the nation’s highly populated coastal regions and including the custom-designed WeatherFlow Hurricane Network. Along with data from other publicly available sources, WeatherFlow distributes its network data to users through a suite of tailored products and services, including web and mobile applications. WeatherFlow also provides forecasting and analysis services and operates the WRAMS mesoscale forecasting model, with standard resolutions down to 2 kilometers and as low as 250 meters for specific applications. WeatherFlow’s clients represent a broad array of interests in the business, government, and consumer sectors. For more information, visit www.weatherflow.com.